When President Donald Trump announced in a tweet that he was withdrawing U.S. troops from Syria, his abrupt decision kicked up one of the most thoroughly bipartisan maelstroms of condemnation in his first two years as president. Trump had telegraphed his intention for months, if not years, but the sudden declaration on December 19 went against the advice, and public pronouncements, of his own national-security team. Republican allies in Congress protested loudly. The widely respected defense secretary, retired Marine Corps General James Mattis, resigned in protest the next day. Within two days, another top U.S. national-security official followed Mattis out the door. On Sunday, in a television interview and in a newspaper op-ed, he laid out his dissent—and his fears for the future. Brett McGurk coordinated the U.S.-led coalition of more than 60 nations that fought the Islamic State terror group and gave international legitimacy to American involvement in a war-torn country where Iran and Russia were making headway. He was one of the rare Barack Obama appointees to keep his job in the Trump administration, but he came with an impeccable Republican pedigree. Soon after finishing a clerkship for U.S. Supreme Court Chief Justice William Rehnquist, a conservative icon, McGurk went to Iraq and worked as a lawyer for the Coalition Provisional Authority. He joined President George W. Bush’s national-security team and stayed on after President Obama’s election, winning enough confidence that the Democrat nominated him as ambassador to Iraq in 2012. He withdrew his nomination after a leaked racy email drew attention to his affair in Baghdad with a reporter, whom he had married by the time of his nomination. Barely a week later came Trump’s withdrawal announcement, quickly followed by McGurk’s resignation, effective December 31. He joined a group of foreign-policy experts at Stanford University’s Freeman Spogli Institute for International Studies. Former Secretary of State Condoleezza Rice, one of his new colleagues, called him “the consummate professional diplomat,” which sounded like an endorsement of his resignation and a subtle rebuke of Trump’s abrupt announcement. Trump took to Twitter to attack McGurk, pointing out that the diplomat was an Obama appointee and bashing him as a “grandstander” since he had simply moved up his exit by six weeks. The president added that he did not know McGurk, his own point man in the fight against the Islamic State. Now McGurk is taking his case to the American public. He says that even with a slightly elongated withdrawal timetable, Trump’s decision has damaged U.S. strategic interests and national security. “Only Russia and Iran hailed Trump’s decision,” McGurk wrote in a Washington Post op-ed that appeared in Sunday’s print edition. “Whatever leverage we may have had with these two adversaries in Syria diminished once Trump said we would leave.” The diplomat wrote that America’s strategic rivals now face little constraint on their military buildup in Syria. Israel, the United States’ closest ally in the region, must step up air strikes to fend off Iranian threats along its northeastern border. McGurk also went on CBS’s Face the Nation on Sunday for one of his first, if not his first, television appearances since leaving the government, aside from a recorded Atlantic event earlier this month. He argued that Trump’s disruption of the status quo was unnecessary. 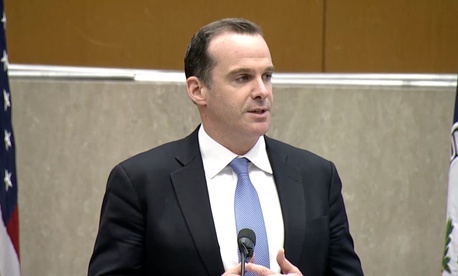 McGurk added that a Turkish military push into Syria would result in a humanitarian disaster for America’s Kurdish allies, who have borne the brunt of the campaign against the Islamic State. But in his op-ed, he dismissed Trump’s latest tweeted proposal, a 20-mile safe zone, as an impractical last-minute idea. He fears what is to come.